❤ Company Introduction ❤ Our Panxuan E-commerce Co., Ltd has 12 years experience in making fashion jewelry. 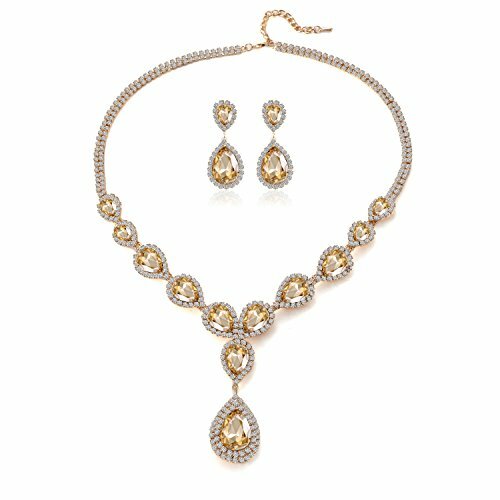 We have 9 jewelry designers who devote themselves to make jewelry with top quality, excellent workmanship, novel designs. We are specialized in making jewelry with many kinds of materials, such as alloy, rhinestone, crystal, stainless steel, pearl… We have gained popularity from consumers abroad. Select us is to select more fashionable and easier life. ❤ Top Material ❤ The Jewelry set is made of great electroplate technique plated copper chain and Austrian crystal. So they have much more smooth and shinning surface than the normal chain and crystal. They are made with great quality materials and excellent workmanship, so there is no need to worry about the quality. ❤ Eco-friendly ❤ Pretty design, nice construction and eye-catching, made of AAA quality and Eco-friendly material. It is absolutely hypoallergenic, no risk and wear anywhere anytime. Excellent and equisite craftsmanship makes you charming and attractive in any occasion. ❤ Handling Time ❤ Arrange the shipment within 24 hours. Two Shipping Method: FBA(Fulfillment By Amazon): Receive the item within 2 days. FBM(Fulfillment By Merchant): Receive the item within 10 days. ❤ Maintenance ❤ 1. Avoid Chemicals. 2. Avoid Bath. 3. Avoid Crash. 4. Avoid Sweet. 5. Avoid Humidity. 6. Wipe with Soft Cloth. 7. Well Save. 8. Substitute Wearing.